Fairy Falls is a great, quick, afternoon hike close to Portland. 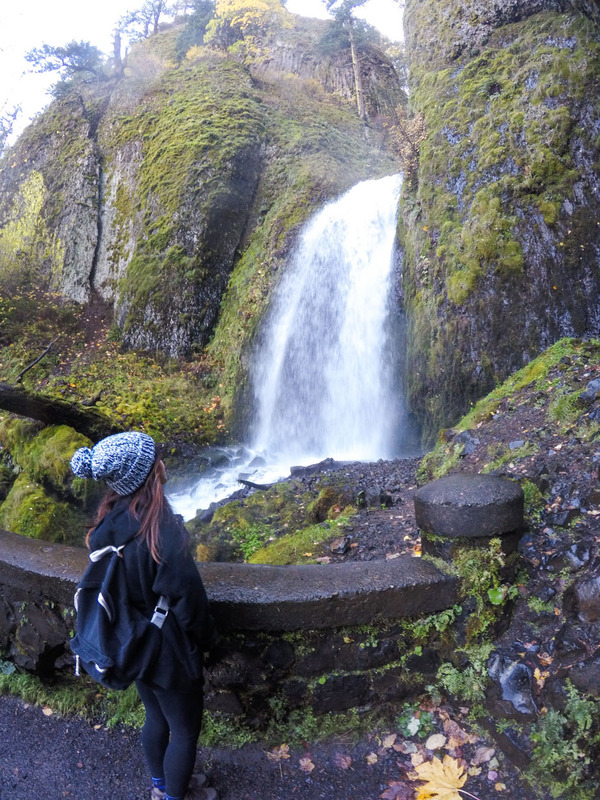 There are so many hikes and waterfalls in the Columbia River Gorge choose from, and we liked Fairy Falls because of its easy access - you get two waterfalls within a mile of each other. Wahkeena Falls is one of the more popular waterfalls in the area, but most do not continue up the trail to the more hidden Fairy Falls. Because of its close proximity to the well-known Multnomah Falls only half a mile away, the parking lot for Wahkeena Falls can easily fill up. Since the parking area at Multnomah is bigger, you can try to find a spot there, and then there is a trail that will take you back to Wahkeena Falls. From the lot you can see the river cascading down from Wahkeena Falls in the distance. Be sure to head right at the fork up the trail, because the left will take you to Multnomah. The trail starts climbing right away, but is paved most of the way, and it's not too long before we reached Wahkeena Falls. Wahkeena was surprisingly powerful and we got soaked just standing on the bridge. Most people will stop here, snap a photo, and then head back to their car since there are no signs indicating there is another fall further up the trail. Keep heading up the switchbacks to Lemmon's Viewpoint, an overlook of the Columbia River with a plaque honoring Keith Lemmons, a firefighter who lost his life fighting a fire in 1863. The grand Columbia River Gorge one of our two sunny days in Portland! After the viewpoint, keep following Wahkeena 420 Trail along the river. Waterproof shoes with grip come in handy here since the trail was quite wet and slippery. After some moderate climbing, we finally reach Fairy Falls! Although it's not as tall as other waterfalls near Portland, the 30 foot fall has a picturesque shape. I love these wide, cascading waterfalls more than the tall, skinny waterfalls that plunge straight down. We only saw one other person at the falls, which was a refreshing escape from the rest of the crowded waterfalls along the Historic Highway. 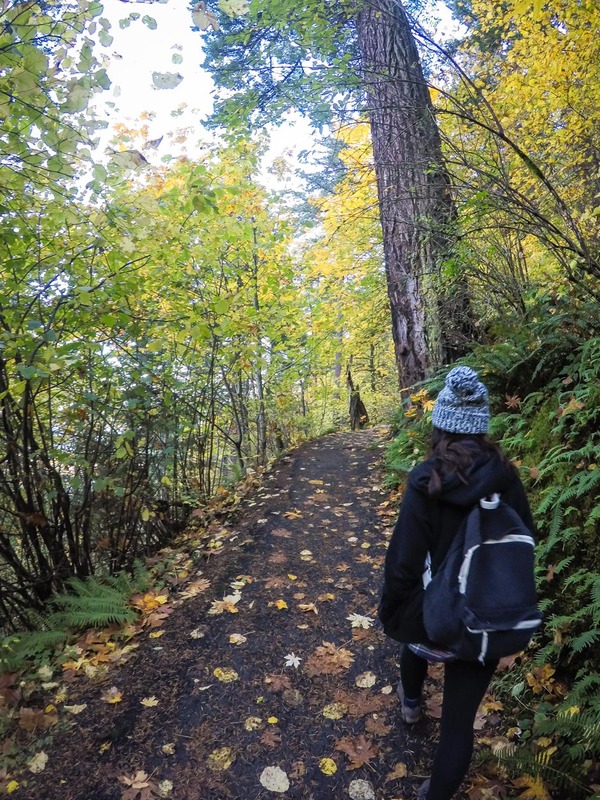 At this point, you could head back, or continue along the trail to other destinations like Devil's Rest and even looping to Multnomah Falls. All in all, if you're trying to decide between the many waterfalls in the Gorge and are short on time, I'd recommend Wahkeena/Fairy Falls because it's a short and quick hike with less visitors.